"Extraordinary…Remarkable… luminous, revelatory memoir about mortality and what makes being alive meaningful ... Lyrical, intimate, insistent and profound. Kalanithi had the mind of the polymath and the ear of a poet." "A vital book about dying. Awe-inspiring and exquisite. Obligatory reading for the living." -- Nigella Lawson "Rattling. Heartbreaking. Beautiful." -- Atul Gawande, author of BEING MORTAL "A great, indelible book ... as intimate and illuminating as Atul Gawande's "Being Mortal," to cite only one recent example of a doctor's book that has had exceptionally wide appeal ... I guarantee that finishing this book and then forgetting about it is simply not an option ... gripping from the start ... None of it is maudlin. Nothing is exaggerated. As he wrote to a friend: "It's just tragic enough and just imaginable enough." And just important enough to be unmissable." * New York Times * "Powerful and poignant." * The Sunday Times * "Less a memoir than a reflection on life and purpose... A vital book." * The Economist * "Extraordinary...Remarkable... luminous, revelatory memoir about mortality and what makes being alive meaningful ... Lyrical, intimate, insistent and profound. Kalanithi had the mind of the polymath and the ear of a poet." -- Heather Hodson * Daily Telegraph * "Powerful and poignant... Elegantly written posthumous memoir... Should be compulsory for anyone who intends to be a doctor... A profound reflection on the meaning of life." -- Daisy Goodwin * Sunday Times * "A stark, fascinating, well-written and heroic memoir." -- Stefanie Marsh * The Times * "The power of this book lies in its eloquent insistence that we are all confronting our mortality every day, whether we know it or not. The real question we face, Kalanithi writes, is not how long, but rather how, we will live - and the answer does not appear in any medical textbook." -- Alice Okeeffe * Guardian * "Exceptional." -- Katie Law * Evening Standard * "When I came to the end of the last flawless paragraph of When Breath Becomes Air, all I could do was turn to the first page and read the whole thing again. Searingly intelligent, beautifully written, and beyond brave, I haven't been so marked by a book in years." -- Gabriel Weston, author of DIRECT RED "A tremendous book, crackling with life, animated by wonder and by the question of how we should live. Paul Kalanithi lived and died in the pursuit of excellence, and by this testimonial, he achieved it." -- Gavin Francis, author of Adventures in Human Being "A remarkable book... Kalanithi writes very well, in a plain and matter-of-fact way, without a trace of self-pity, and you are immediately gripped and carried along... [He] was clearly a deeply thoughtful and compassionate man, and his death is a great loss to medicine, but at least he has left this remarkable book behind." -- Dr Henry Marsh * Observer * "A meditation on what makes a life worth living." * Guardian * "It turns out not really to be about dying at all but about life and how to live it - though the closeness of death gives it an urgency and economy... When Breath Becomes Air is a Renaissance book from a Renaissance man. It is a work of philosophy and morality, a reconciliation of science and religion. There is even plot and excitement... It was only with the restrained, elegant epilogue written by his wife Lucy Kalanithi that I found myself weeping helplessly... When Breath Becomes Air tells us what means to live a good life, by giving us a glimpse into an exceptional one." -- Lucy Kellaway * Financial Times * "A powerful and compelling read." * The Economist, Book of the Year * "An astonishingly affecting memoir and eloquent examination of what it is to be human and confront your own mortality... This is a remarkable book by a man who was driven by his passion for his life, his loves and his career. His death is undoubtedly a tragedy but in writing this memoir he has guaranteed that his voice and the important story it tells will resonate for years to come." -- Mernie Gilmore * Daily Express * "As thought-provoking as it was moving. The sheer exuberance of Kalnithi's intellectual curiosity shone through in his writing." 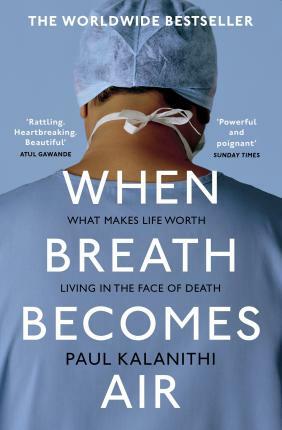 -- Katie Law * Evening Standard, Book of the Year * "Dr Kalanithi describes, clearly and simply, and entirely without self-pity, his journey from innocent medical student to professionally detached and all-powerful neurosurgeon to helpless patient, dying from cancer. He learns lessons about the reality of illness and the doctor-patient relationship that most doctors only learn in old age but Paul Kalanithi died at the tragically early age of 37. PAUL KALANITHI was a neurosurgeon and writer. He held degrees in English literature, human biology, and history and philoso-phy of science and medicine from Stanford and Cambridge universities before graduating from Yale School of Medicine. He also received the American Academy of Neu-rological Surgery's highest award for research. His reflections on doctoring and illness have been published in the New York Times, the Washington Post and the Paris Review Daily. Kalanithi died in March 2015, aged 37. He is survived by his wife, Lucy, and their daughter, Elizabeth Acadia.